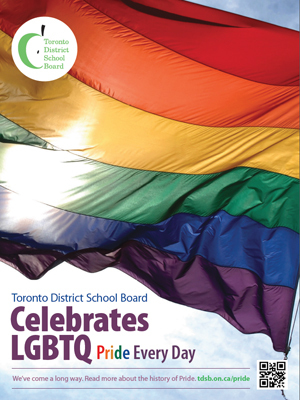 Our TDSB community has a rich culture and history of celebrating diversity and our LGBTQ community every day. Learn more about the history of Pride by visiting Pride Toronto and learn more about how we celebrate at the TDSB. Join us at the Toronto Pride Parade! Toronto's annual Pride Parade will take place on Sunday, 24 June 2018, and a proud TDSB contingent of students, staff, Trustees and community members will be taking part, just like we've done every year since 2000. All TDSB participants are asked to gather between 12:00 and 1:00 PM in Asquith Green Park (west side of Church St.1 block north of Bloor). TDSB staff will be waiting at the park to distribute TDSB Pride T-shirts, and to direct participants to the right mustering location. You'll have the option of marching in the Parade or riding on the TDSB float. A vehicle will also be available for those who require it. Please note: Pride organizers will let us know our assigned mustering location a few days before the Parade. Participants have the option of marching in the Parade or riding on the TDSB float. A vehicle will also be available for those who require it. The Parade will begin moving from Yonge and Bloor at 2:00 pm, and will conclude at Yonge and Dundas at 6:00 PM. Follow all the fun on Parade day via Twitter (#PrideTDSB). Every year, three outstanding trans-positive GSAs/QSAs in the Toronto District School Board are recognized through the Director’s GSA Awards. Three $1,000 awards are awarded to student-led groups that have demonstrated a committed effort in helping create a school climate that is safer and more positive for students and staff of all sexual orientations and gender identities. Applications are now open for 2018! Submission deadline is June 8, 2018. On April 11, staff and students from across the Toronto District School Board wear pink to mark International Day of Pink. This is a day of action, created when a youth in a high school in Cambridge, Nova Scotia was bullied because he wore a pink shirt to school. His fellow students decided to stand up to bullying; and hundreds of students came to school wearing pink to show support for diversity and stopping discrimination, gender-based bullying, homophobia and transphobia. This year students participated in activities to help celebrate International Day of Pink and shared their efforts on Twitter. Ontario has designated the week beginning on the third Sunday of November as Bullying Awareness and Prevention Week to help promote safe schools and a positive learning environment. During this week, our students, staff and parents work together create learning environments that are caring, safe, peaceful, nurturing, positive, and respectful where all students are able to reach their full potential. Promoting caring, safe and accepting spaces is an important priority of the TDSB. In 2013, the Board adopted comprehensive procedures aimed at establishing a framework to enable, support and maintain a positive school climate. To learn more please read our P.051 Caring and Safe Schools policy and our procedures PR 702: Progressive Discipline and Promoting Positive Student Behaviour and PR 703 Bullying Prevention and Intervention. If you want support launching a GSA, planning activities, holding a Pride event, or similar school based activities, contact the Gender-Based Violence Prevention Office. 1995 The Triangle Program (Canada’s only high school classroom for LGBTQ youth) opens as a satellite of Oasis Alternative Secondary School. It serves students from ages 14-23 and operates in the Metropolitan Community Church of Toronto. 2000 TDSB Officially participates in the Toronto Pride Parade with a float carrying Trustees and staff and student marching contingent. 2006 TDSB Publishes “Anti-Homophobia Education Resource Guide” for staff of all grade levels. 2009 The Board establishes the Gender-Based Violence Office, the first of its kind in Canada. Their core function is to prevent and address gender-based violence, homophobia, sexual harassment, and inappropriate sexual behavior by students towards other students in their schools. 2010 The Board adopts its Gender-based Violence Policy. 2010 TDSB officially hosts Unity as an annual GSA student conference. 2010 TDSB Launches its Positive Spaces Campaign – a Board-wide K-12 initiative that ensure at least one trained rep in and designated spaces or spaces in every school with the purposes of being welcoming, affirming and inclusive for students and staff of all sexual orientations, sexual identities, gender identities and gender expressions, as well as anyone seeking information or support on any issues related to bullying, violence, gender, sexuality and or healthy relationships. 2011 The Gender Independent Group (GIG) is formed. This group meets monthly to support gender independent children and their families. 2011 The Trustees of the TDSB unanimously declare the Board a GSA in support of students. 2011 The Director’s Office creates a new annual student leadership award for the top 3 school students groups called Director’s GSA Awards. 2011 TDSB Publishes “Challenging Homophobia and Heterosexism a K-12 Curriculum Resource Guide” that updated and combined all previous associated resource guides. 2011 Guidelines for the Accommodation of Transgender and Gender Non-Conforming Students and Staff are created by the Board. 2013 TDSB and Egale co-host Canada’s First National GSA Summit for high school students. 2014 TDSB Trustees endorse a motion re-affirming the Board commitment to official participation in the Toronto Pride Parade.